An author sits alone. Sometimes the words flow, they trip over themselves before the ink can form them on the page. The stories tell themselves to the author and he simply writes them down. Sometimes the blank page mocks, the empty whiteness is scornfull and contemptuous and all of the author's attempts are rebuffed. Sometimes he needs to take a break, sometimes he needs to experience something new, sometimes all he needs is the write space. I was following my camera around Victoria last weekend and I was taken in by some of the narrow alleys in the older areas of downtown. I took quite a few photos but I was walking quickly down the street to meet my wife and I happened to glance down this one to my left. 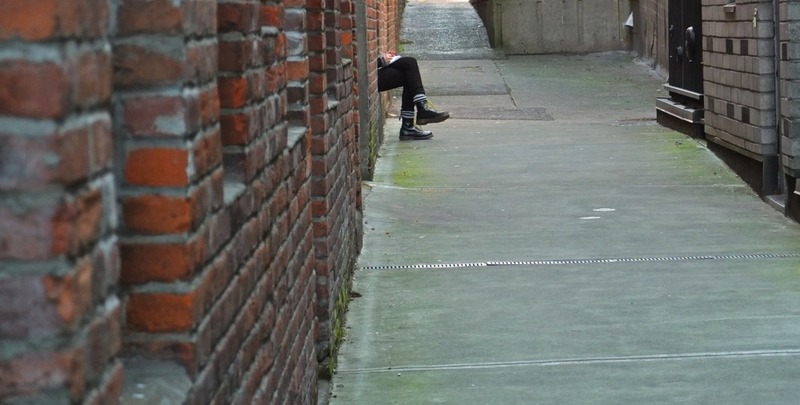 I saw this person sitting in a kind of an alcove in the brick wall with their legs out in the alley as they wrote in a notebook. I immediately knew that I had a great image if he or she would stay their long enough. I only had a 10-22mm on my 7D and I snapped off a few but she appeared so far away that I pulled out my X10 and moved in a little closer. The little Fuji is a perfect street camera, it is small, light, and quiet and most importantly it has that fast f/2.0-2.8 lens. In post I cropped out the top of the photo as the end of the alley was a filled with very bright, distracting sunlight. I was very, very pleased with the result.